Ah Fall! The mostÂ brilliant time of the year in my opinion. Talk about sensory perception: there’s a crispness in the air that hits your cheeks and nostrils every morning. The smell of earth and leaves is pungent and foliage on the trees is visually stunning. And don’t get me started on the food. The FOOD! Squash, carrots, potatoes, tomatoes, cauliflower, beans, beets (gasp for air), lettuce, turnip, apples, pears, peaches, plums (tell me when my birthday comes! )….All I want to do at this time of the year is plant bulbs in my garden, cook stews and soups, bake pies and crisps, climb into a cable-knit sweater and cozy down for hibernation. No, I’m not a huge fan of winter, but I do love Fall. 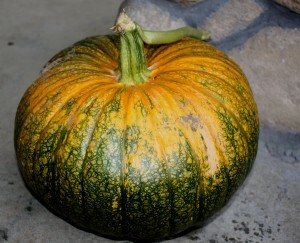 I have now grown pumpkins in our garden for the last three years, although only successfully two out of those three. This year was the banner year, by far. The pumpkin plant overtook the entire garden patch sending it’s prickly tendrils into every other plant growing–my poor sunflowers barely stood a chance. The plant reminded me of the one in the Little Shop of Horrors (remember “feed me seymour”?). It grew and grew and grew, and for all it’s effort it produced one brilliant pumpkin. The kids are thrilled and the pumpkin now sits proudly on our front stoop awaiting carving for Hallowe’en. 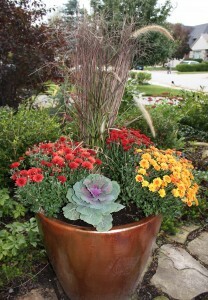 And it sits in close proximity to my planter, which now houses some lovely mums, false cabbage and tall grasses. I really must say I can get into the spirit of the season, however fleeting it is. « Bagels and Cupcakes and Tracy Morgan, Oh My!